Next week (Thursday 23rd to Sunday 26th September) Graffito will be exhibited at the Tent Digital in the Truman Brewery, Brick Lane as part of the London Design Festival. Around 19,000 visitors are expected at the venue over the four days, and we will also be presenting the project at a special event for UK Trade & Investment. We’ve created a special Diffusion eBook about the project for the event – where we’ll have some PPOD printed copies to give away. We’ve also done some early analysis of the server logs. To date we’ve had over 8,000 downloads of the App from the iTunes App Store and 18,000 connections since August 10th (that’s about 500 people a day playing with it). 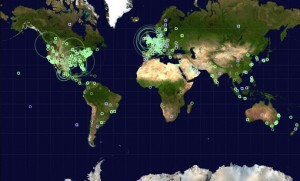 The map below shows where people have been connecting from (based on their iPhone/iPad GPS). Come along and take part.